← How to use calibre with a network drive? With NFS! As a long time SourceForge user, I initially ignored GitHub, so I had no direct contact with markdown. I did heavily use the MediaWiki format, and definitely preferred it over HTML, but I was annoyed by the proliferation of wiki formats, and initially included the markdown in the same annoying yet-another-markdown-format gang. But more and more open source projects included README.md files, and my frustration grew, since the OS X Preview application had no support for it, and I could not read them as easily as the classical README.txt files. Then I discovered Docker, and when I had to finally post my first Dockerfile somewhere, GitHub came as a convenient solution. So I realised how easy to use are the markdown files, and how nicely they fit in the general GitHub ecosystem. Currently OS X does not provide any support to view or edit markdown files (at least up to OS X 10.10.5). There are many third party solutions, each with their Pros and Cons. I tried several, and I first stopped at Easy Markdown (available from AppStore), but later abandoned it in favour of the much more general (and open source) Atom (also courtesy of GitHub). 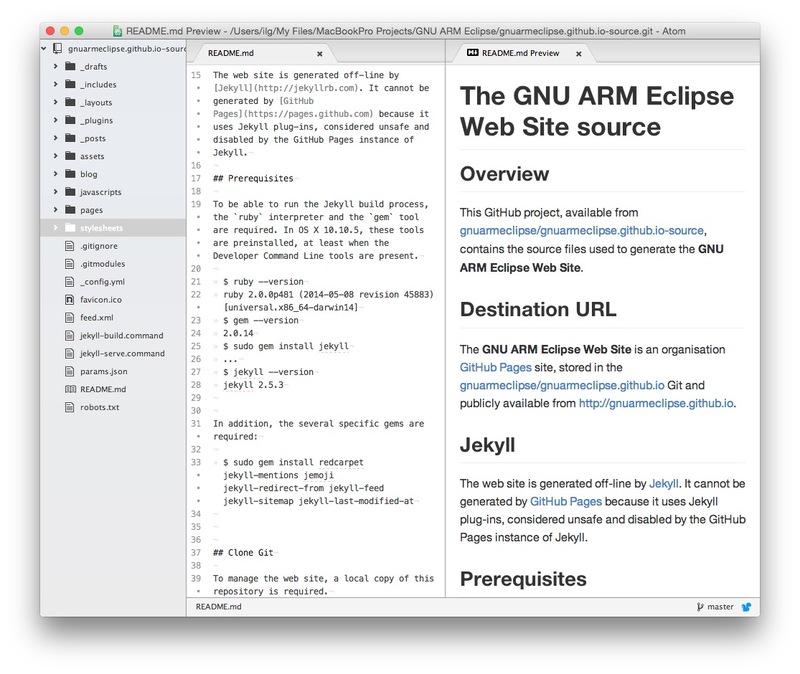 Atom has many interesting features, but the one we are interested here is the markdown preview, as a split window. Editing of markdown is not a WYSIWYG, but preview is instantaneous, which makes it the second best choice in terms of convenience. Since I discovered markdown I almost completely switched to it; this decision works hand in hand with the decision to migrate all my projects to GitHub, where markdown is a natural choice, being automatically rendered by the Git web viewer. Even more, after migrating the project webs from WordPress and MediaWiki to the static page generator Jekyll, markdown is the only format used to write all web content, which is a great simplification. It is obviously not a format for writing books, or complex documents, but I think it is ideal for on-line content, and I hope it’ll slowly become the de-facto markdown standard.